Presenter: Andrew Simpson from B-Corp Canada. 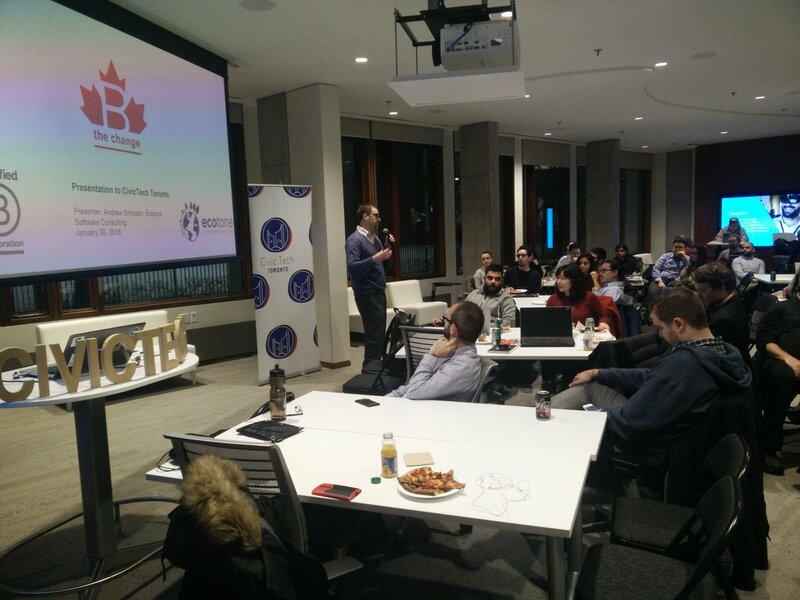 Presenting: Andrew shared a presentation on the B-Corp movement in Canada. Andrew demonstrated the need for business to be geared towards providing social benefit, some key organizations in the space, and the values propelling it all forward. Budgetpedia Jim Description of project: Bringing transparency, and understanding, to Toronto’s budget. Bike Parking Jake Description: A webapp which will allow cyclists to drop a pin on a map of Toronto indicating insufficiencies in bike parking infrastructure. We believe that the most valuable data to improve Toronto’s bike parking will be crowdsourced. What we’re doing today: Discussing our survey, sprinting towards our MVP! TTC Subway Dashboard Project Raphael Description of project: Build the political will to improve transportation. Law and Design Team Avery Description of project: Improving access, usability of legal information. There is an access to justice crisis! DemocracyKit Tech Team Chris Description of project: We are an open online platform to share advice and campaign technology with campaign teams running for municipal office. Develop search widgets for resource library, events, etc. Women and Colour Mohammed Description of project: Online community of talented women and people of colour available for speaking opportunities at tech-related events. TheCarded.ca Sharky Description of project: We are Human Centered Design (HCD) platform that simplifies for organizations and community professionals to track their efforts and work in conjunction with policing policies. Chalmers Cards Zach Description: Chalmers Cards are laser-cut wooden handouts that explain how to access public resources for folks in tight financial situations. Stuff like toll free numbers for shelter referral, financial aid registration, and free legal aid. These cards have been a real hit! I’m having trouble meeting the demand for these in the shelters on my own, so I’m looking for folks to help out with laser cutting them! What we’re doing today: Looking for feedback on the latest Info Card Prototype!! -Graphic Designer to help design the card layout! Public Education App Idea(s) Allister Description of project: Looking to develop an educational app idea for kids.